Docker was quick to share and setup. Docker had become available on RPI. Allow very quick, repeatable installs. Main goal was to allow me to install many RPI's in various locations. It required some unix command line knowledge. Images would have versions hard baked unless recreated. Environment variables had to be hand written into docker-compose.yml file. RPI's still required manual intervention (i.e. to change something, I needed physical access - which is difficult for RPI's I intended to install in other countries). A couple of weeks ago I stumbled across Resin.io. It seemed to resolve many of my issues. I am very happy with the results and thought I would share my project with everyone else. 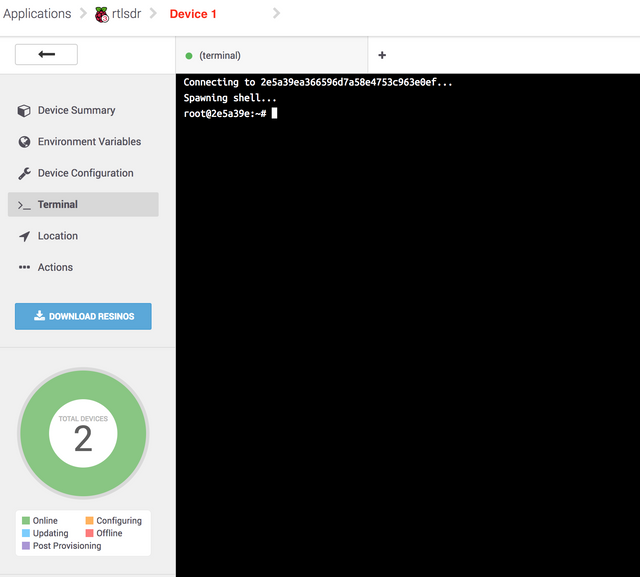 Deploy first device in under 20 minutes. Deploy subsequent devices in under 5 minutes. Allow very quick, upgrades of software in around 2 minutes (on all devices). Remote manage and control all devices (even if they are not inside my current network). Obviously a Raspberry Pi (2 or 3 is best). Access to a command line with git (could be Windows, Linux, Mac OS). Other accounts for Flightradar24, Flightaware also included. Download Resin.io image for your device, install, plugin. 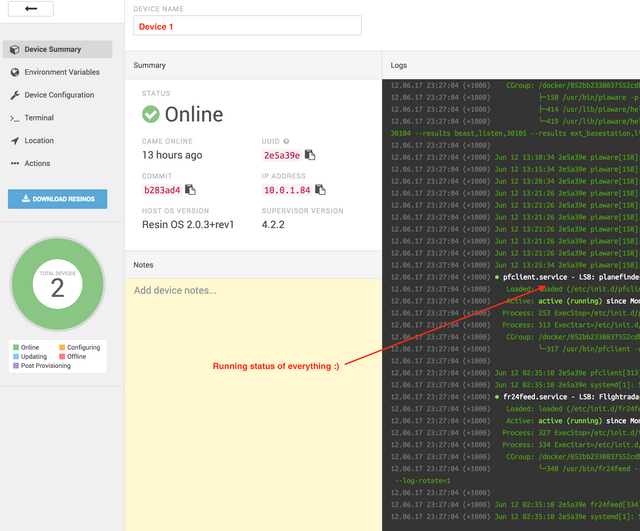 See device appear on Resin.io and add required variables. Clone my repo which contains basic Docker template, start up scripts. Set git remote of your new clone to your Resin.io account, push. Wait - and you're done. Resin.io uses a Docker template to re-create the images whenever anything changes. This takes the hard work out of you getting involved. This also means that when there is a software change, it's very easy to trigger Resin.io to create a new image. Resin.io does all the heavy lifting, it downloads the new software, compiles it and puts it into a new Docker image which is downloaded to your device. So easy!!!! Only need to copy a couple of git commands. Working with Resin.io requires interaction between files on your computer and Resin.io using git. If you have Linux or MacOS, these are already inbuilt. If you have Windows, these do not come preinstalled and will require some installation. The following guide might help. If you already have these, skip to Procedure. Create a new application in Resin.io for a Raspberry Pi (2 or 3 - this doesn't seem to matter). Click on your Application, then click "Download Resinos" to download the Resin.io OS. Follow these instructions. A copy of your ssh public key. Resin.io's application https://etcher.io/ is best for creating images. Wait for your device to become available on Resin.io website. 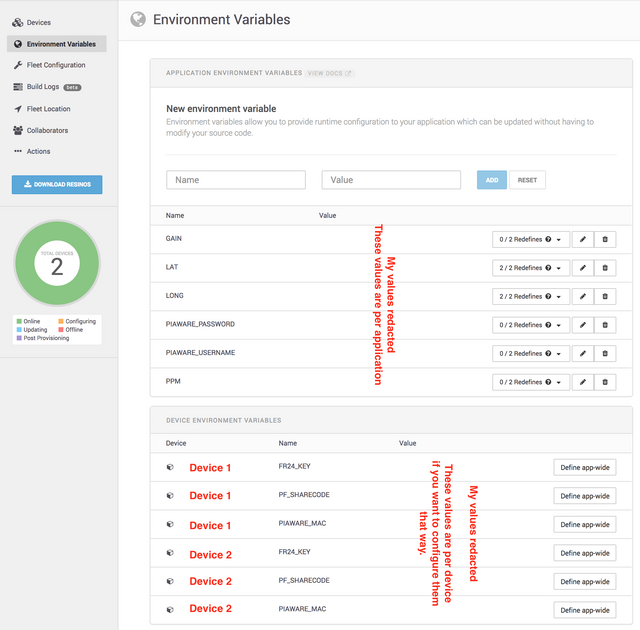 Select "Environment Variables" on the left of the Resin.io window. Resin.io allows for variables to be set per application and/or by device. The advantage in this is it allows you to have many devices in varied locations with varied accounts. I've created everything you need code wise to get this working. You don't need to do anything except setup your accounts, and push the code. Clone my repo from https://bitbucket.org/inodes/resin-docker-rtlsdr (type this verbatim) using git clone <myrepo>. Receiving objects: 100% (178/178), 21.84 KiB | 0 bytes/s, done. Paste the git remote command onto command line (your command will differ). The above output is the build from scratch of everything required to run Planefinder and other utilities. The great thing about this is that if you have many devices, they are all updated. Once your device is up and running, there are a few things to note. 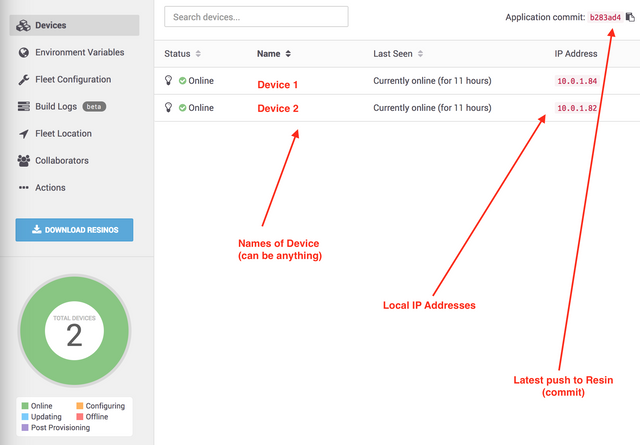 Resin.io allows you to see the status of each device and control it. If you change the location of a device, just change the variable for LONG and LAT. The device automatically rebuilds using the new variables. See the current state of the device. Easy to see the output from the current Docker image. See the ip - from here if you're on the local network, you can connect to the device as per usual (e.g. in my case, opening http://10.0.1.84:30053/ on my local network gives me the normal planefinder client UI). Connect to any device from any location, even if you're not on the local network. Debug the application. You could for example change the scripts I provided completely, push again to resin and have a completely different result. It allows flexibility on scale. I think I missed something, or maybe I'm not understanding what is happening on my side ..
First I tried a Windows computer but I can't pass the above line of code. Then I tried to use a Mac Os X High Sierra, 10.12 version. Writing objects: 100% (235/235), 29.41 KiB | 14.71 MiB/s, done. [Build]    E: Some index files failed to download. They have been ignored, or old ones used instead. [Build]    E: Unable to lock the administration directory (/var/lib/dpkg/), are you root? The only thing I can see is that my microSD is "out of space" although I'm using a 32Gb, class 10 stick. Every time I failed, I deleted everything and started allover but I can't see where is the error. I think your Github file should have a line where it expands FileSystem to ensure all SD card storage is avaiable to the OS. Also I don't know exactly how to SSH to gain access to the file system. I think you also have anticipated this option. I also noticed that you used Raspbian Jessie version instead of Stretch so that poses less problems. I'm not looking to complicate your script (as it has issues compiling Dump1090). I know how to do it but I don't want to walk in more troubles. The space this refers to is actually at Resin.io itself (or its git repo - your remote). $ git remote -v | egrep ^"resin"
If these aren't exactly right, you might have to re-set your master as per the command resin has put there for you. I use two applications actually. I have created a second application for testing purposes. And you can too. On Resin create a second application. Let's say, adsbtest (using your original name of adsb). Once you create this, you'll note a new git remote command on your resin side. This will do the heavy lifting at Resin.io prior to your device even knowing about it. Your device will be on "adsb" NOT "adsbtest". If this works, click on your device, click "ACTIONS" in top right, select "Move Device", and the only option will be "adsbtest". Note, that this allows you to move between a testing and production environment easily. You can move it back at any time. An example of where this become useful is if you want to create changes to the scripts. You could make the change on your side, push it to "adsbtest", move your Device. If you don't like the results, you move it back to "adsb". While typing this, I basically did the same to move to a new version of the client. Easy. Hope this helps. If problems persist, try posting on the Resin.io forum. This is certainly an issue on their side, not yours. I have not tested yet but I can see that the main problema is that I don't have enough reading about the Resin.io Dockers. Can you suggest me some blog or, maybe a YouTube so I can understand better how Resin.io Dockers? I'm a "reading man" so don't spend time with YouTube,unless you know some very special video. That's why I'm very interested on this topic. To boil it down, your git client is really your first step to cloning my code. Making it your own would simply require either Bitbucket or Github repo you can clone. This isn't compulsory, but this would allow you to change the code, and that would be where you would git push (origin). Having many RPI's and many locations was the reason I moved my project to Resin.io. You can have 5 devices for free. This proved itself handy when I visited my wife's family in Japan. I removed one of my Sydney based RPI's, plugged it in when I got to Japan. I changed the GPS co-ordinates and various id's (I had to pre-arrange a couple, but that's not hard to do). It took about 3 minutes for the changes to kick in. I could have started from a blank SD, and it would have taken no more than 5 minutes. Remote access into these is very straightforward with Resin.io as well. I can monitor and reboot without an issue. If however the power was interrupted, I'd just have someone at the other end turn on and off the power, and it would come alive again in Resin.io. My previous solution used Docker and Docker compose. Resin doesn't allow Docker compose, so my docker file is really a group of applications in the one container (normallly a no-no, but it works). And thankfully Resin uses the benefit of Docker's repeatable and predictable image to build everything from scratch. To install new versions of any of the clients, make a simple change to any of the scripts (i.e. put a space - which has no consequence - in the start.sh from my repo), push it to the remote (Resin), and Resin will completely re-build the image from scratch. If there is a new version of the client software, it gets included immediately. The error you're getting above though is odd. It might be as simple as not having the right remote. I'd still double check your addresses. Delete and re-create the application if required. Although it doesn't pertain to the Planefinder client, Flightaware moved away from using a MAC Address (the hardware address of the ethernet adapter), to an ID. I instead included PIAWARE_ID to map to this. Booting your device would warn you of this. This might be a build error as well. Go to your Resin dashboard and click on your application, then "Releases". It should list the various times you've pushed a change using "git push resin master". These builds represent the equivalent of a whole new Docker image and will have a unique commit code. Each time you add a new RPI to this application, it receives the latest build. This is also the reason I have two applications - one for my working production, and one for testing. I can make changes to the code, push this to the test, the move devices to this. This could for example test a new version of the clients, or a change to the Dockerfile or start.sh. If I didn't like the result, I would move my device back and it would boot up with the old versions. If I did like the result, I would simply run a new "git push resin master", a new build would be created and the remaining devices would all update. Easy! [Build]    ca-certificates is already the newest version. [Build]    0 upgraded, 48 newly installed, 0 to remove and 12 not upgraded. [Build]    Need to get 52.3 MB of archives. [Build]    After this operation, 166 MB of additional disk space will be used. [Build]    Selecting previously unselected package libapt-inst1.5:armhf. [Build]    Selecting previously unselected package libxml2:armhf. [Build]    Selecting previously unselected package cmake-data. [Build]    Selecting previously unselected package liblzo2-2:armhf. [Build]    Selecting previously unselected package libarchive13:armhf. [Build]    Selecting previously unselected package libexpat1:armhf. [Build]    Selecting previously unselected package libjsoncpp0. [Build]    Selecting previously unselected package cmake. [Build]    Selecting previously unselected package libasan1:armhf. [Build]    Selecting previously unselected package libatomic1:armhf. [Build]    Selecting previously unselected package libisl10:armhf. [Build]    Selecting previously unselected package libcloog-isl4:armhf. [Build]    Selecting previously unselected package libcurl3-gnutls:armhf. [Build]    Selecting previously unselected package libglib2.0-0:armhf. [Build]    Selecting previously unselected package libgomp1:armhf. [Build]    Selecting previously unselected package libicu52:armhf. [Build]    Selecting previously unselected package libmpfr4:armhf. [Build]    Selecting previously unselected package libubsan0:armhf. [Build]    Selecting previously unselected package libmpc3:armhf. [Build]    Selecting previously unselected package apt-utils. [Build]    Selecting previously unselected package libpsl0:armhf. [Build]    Selecting previously unselected package wget. [Build]    Selecting previously unselected package bzip2. [Build]    Selecting previously unselected package patch. [Build]    Selecting previously unselected package xz-utils. [Build]    Selecting previously unselected package binutils. [Build]    Selecting previously unselected package libc-dev-bin. [Build]    Selecting previously unselected package linux-libc-dev:armhf. [Build]    Selecting previously unselected package libc6-dev:armhf. [Build]    Selecting previously unselected package cpp-4.9. [Build]    Selecting previously unselected package cpp. [Build]    Selecting previously unselected package libgcc-4.9-dev:armhf. [Build]    Selecting previously unselected package gcc-4.9. [Build]    Selecting previously unselected package gcc. [Build]    Selecting previously unselected package libstdc++-4.9-dev:armhf. [Build]    Selecting previously unselected package g++-4.9. [Build]    Selecting previously unselected package g++. [Build]    Selecting previously unselected package make. [Build]    Selecting previously unselected package libtimedate-perl. [Build]    Selecting previously unselected package libdpkg-perl. [Build]    Selecting previously unselected package dpkg-dev. [Build]    Selecting previously unselected package build-essential. [Build]    Selecting previously unselected package liberror-perl. [Build]    Selecting previously unselected package git-man. [Build]    Selecting previously unselected package git. [Build]    Selecting previously unselected package git-core. [Build]    Selecting previously unselected package libusb-1.0-0-dev:armhf. [Build]    Selecting previously unselected package pkg-config. [Build]    No schema files found: doing nothing. [Build]    -- Build type not specified: defaulting to release. [Build]    -- Install configuration: "Release"
[Build]    -- Set runtime path of "/usr/local/bin/rtl_sdr" to ""
[Build]    -- Set runtime path of "/usr/local/bin/rtl_tcp" to ""
[Build]    -- Set runtime path of "/usr/local/bin/rtl_test" to ""
[Build]    -- Set runtime path of "/usr/local/bin/rtl_fm" to ""
[Build]    -- Set runtime path of "/usr/local/bin/rtl_eeprom" to ""
[Build]    -- Set runtime path of "/usr/local/bin/rtl_adsb" to ""
[Build]    -- Set runtime path of "/usr/local/bin/rtl_power" to ""
[Build]    Connecting to flightaware.com (flightaware.com)|70.42.6.250|:80... connected. [Build]    Selecting previously unselected package piaware-repository. [Build]    0 upgraded, 18 newly installed, 0 to remove and 12 not upgraded. [Build]    Need to get 9698 kB of archives. [Build]    After this operation, 43.3 MB of additional disk space will be used. [Build]    Selecting previously unselected package libtcl8.6:armhf. [Build]    Selecting previously unselected package libbladerf1:armhf. [Build]    Selecting previously unselected package librtlsdr0:armhf. [Build]    Selecting previously unselected package init-system-helpers. [Build]    Selecting previously unselected package mime-support. [Build]    Selecting previously unselected package itcl3:armhf. [Build]    Selecting previously unselected package libfam0. [Build]    Selecting previously unselected package libterm-readkey-perl. [Build]    Selecting previously unselected package libterm-readline-perl-perl. [Build]    Selecting previously unselected package lighttpd. [Build]    Selecting previously unselected package tcl8.6. [Build]    Selecting previously unselected package tcl. [Build]    Selecting previously unselected package tcl-tls. [Build]    Selecting previously unselected package tcllib. [Build]    Selecting previously unselected package tclx8.4. [Build]    Selecting previously unselected package libbladerf-udev:armhf. [Build]    Selecting previously unselected package dump1090-fa. [Build]    Selecting previously unselected package piaware. [Build]    invoke-rc.d: policy-rc.d denied execution of start. [Build]    Enabling lighttpd integration (stat cache)..
[Build]    invoke-rc.d: policy-rc.d denied execution of restart. [Build]    invoke-rc.d: unknown initscript, /etc/init.d/rsyslog not found. [Build]    Connecting to client.planefinder.net (client.planefinder.net)|80.239.137.66|:80... connected. [Build]    Selecting previously unselected package pfclient. [Build]    0 upgraded, 1 newly installed, 0 to remove and 12 not upgraded. [Build]    Need to get 1288 kB of archives. [Build]    After this operation, 563 kB of additional disk space will be used. [Build]    Selecting previously unselected package fr24feed. [Success]  Image passed integrity checks! Now I´ll fiddle a little more with theory and practice, so far so good! [Build]    gpg: no valid OpenPGP data found. Sorry to disturb you that much but I think this thread may help several people, so I´m insisting on it. Can you point me the right direction? I still believe that computers should do what humans want them to do and not vice-versa.